For many readers, the name of Irene Nemirovsky first came to their notice with the rediscovery of her lost work, “Suite Francaise” (now being turned out as a blockbusting feature film). However, during the inter-War years of the 20th century, she had a flourishing career as a novelist, publishing books regularly during the 1930s. However, during WW2 her Jewish ancestry became an issue within Paris and she was eventually deported to Auschwitz, where she died of typhus. Her husband was sent there shortly afterwards and gassed. It was not until the late 1990s that Nemirovsky’s daughter realised that the notebooks her mother had left behind were the unfinished novel “Suite Francaise”, and publication of this brought Nemirovsky back into the public eye. 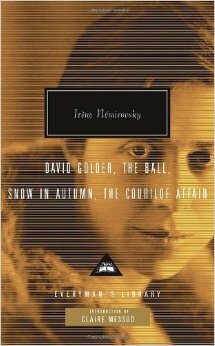 I read “David Golder” some years ago, and enjoyed it. However, I struggled with SF, and never finished it, though people have been telling me ever since that I really should try again. But I picked up a lovely hardback collection of four shorter works recently in the Samaritans Book Cave, and decided that some shorter works might be a good way to rediscover Irene Nemirovsky. And “The Ball” is certainly brief – halfway between a short story and a novella, it tells of Antoinette Kampf, a 14-year-old living in Paris with her mother and father. The family is nouveau riche – the father has made money out of business and the mother is from a somewhat dubious background, with pretensions to mixing in higher society. To this end, she’s decided to hold her first ball, with all the complex planning that goes with it. Of course, young Antoinette is desperate to attend, but that’s unlikely, as her relationship with her mother is not a good one. I’m *so* glad I picked this one up in a whim in the Samaritans, as it’s really rekindled my interest in Nemirovsky’s writing – and I’m now very much looking forward to the other stories in the book!